These are all tasks that lead shoppers to businesses in their area. Voice tech opens up new ways for your customers to find you. Optimizing your business for voice will help you get ahead. Furthermore, new integrations (such as Grubhub Reorder) can help customers access your business through voice without you having to do anything. Voice can also help business owners streamline administrative tasks, freeing up time for them to focus on big-picture items. The majority (91%) of voice command usage occurs on smartphones. Mobile voice searches are 3x more likely to be locally based. That means individuals using voice are looking for stores they can walk or drive to. Making sure you have localized SEO keywords will help you get found through voice. It’s also important to have your business appear in the top three results for a few specific keywords. It won’t be cost effective to try and land in the top three search results for many keywords, but a few will help you get ahead in a meaningful way without stretching your marketing budget too thin. Finally, make sure your website loads quickly (test on Google here). Fast loading sites have a higher chance of getting used by voice tech. For most small businesses, building out an Alexa skill or Google Action is likely not worth the investment. A more efficient approach would be to take a look at the Apps people already use to find you. For restaurant owners, online order apps are an important way to take advantage of existing skills. Grubhub Reorder: Offers an Alexa skill where voice users can reorder delivery from their favorite restaurants. Restaurants that are already using Grubhub for takeout or pickup can now be accessed by customers who are looking to place an order with voice. Maybe they’re in the car on the way to your restaurant or performing a task that keeps them from their computer. They’ll still be able to order takeout from their favorite restaurant without stopping what they’re doing. Opentable: Users can access Opentable through Alexa or Google Home. Apps offered by companies customers already use to find/use your business can be an effective way to be found online without having to invest in voice tech. Opentable will help streamline the customer experience, providing them with more options to get them in the door. As long as your business is already using Opentable (if you don’t you should), customers will be able to use the Opentable app to make reservations at your restaurant. There are also apps that connect homeowners to handymen and contractors. HomeAdvisor: HomeAdvisor is an Alexa Skill that connects homeowners with prescreened contractors for service projects. Voice is great for contractors because customers can describe an issue or project they would like to tackle hands free, giving them the space to view and accurately describe the potential project to HomeAdvisor. Locals can also take advantage of regional real estate voice apps to rent out their properties. Rental Homes: Users can use Rental Homes on Google to find rental apartments, homes, and condos. Rental Homes can narrow a user’s search based on location, number of bedrooms, and budget. Local real estate agents and landlords can make use of the app to advertise their listings to a new market of potential renters. Voice tech can also help business owners keep track of administrative tasks, helping them focus on big-picture items and on growing their business. Voice commands on Amazon Echo, Google Home and Siri can help business owners sort through emails, order supplies, and manage their calendar. Amazon Daily Routine Skill: automates tasks based on commands. A business owner could include a routing that tells her what’s listed in her calendar for the day. A business owner could set a reminder to order more supplies. Google Express: lets users shop at national, local and online stores such as Costco. A business owner could order office supplies from Costco without even having to search online for products. Furthermore, delivery is free for most orders over $25. Siri: Easily pull up information without having to search online. A restaurateur can pull up the day’s weather relatively hands-free before deciding whether to open up the patio for lunch. Voice is an essential way for businesses to streamline tedious tasks so that business orders and employees can more efficiently make use of their day. Make sure your website is as mobile/SEO friendly as possible. Look into apps already using voice related to your business. Your business may be able to benefit from them. 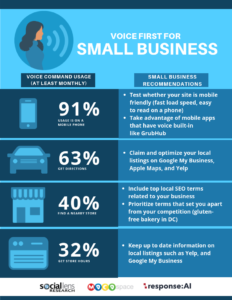 Use voice apps to create a more efficient office for your small business. 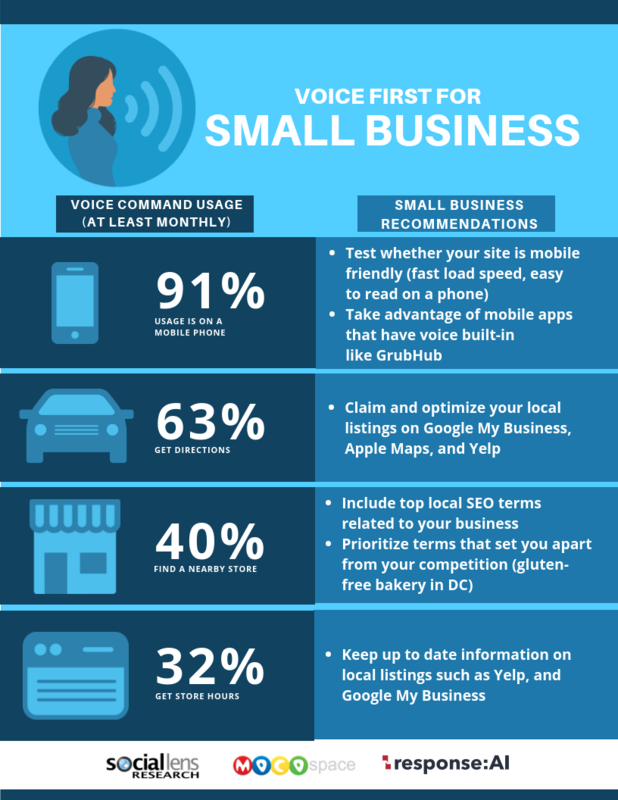 Let us know how your small business is benefiting from voice.